For some time now you can watch and follow Mr. Selfridge daily affairs through Netflix and some TV channels. The series is based on the biography “Shopping , Seduction & Mr Selfridge ‘ Lindy Woodhead. It is broadcast at a time when the current shopkeepers are called to change, to anticipate and be entrepreneurial. In my opinion, the series offers a portrait of the entrepreneur Selfridge and his view of enticing customers to buy. An attitude and approach that also could cut timber definitely at this time. Harry Gordon Selfridge was an American and self-made man, an entrepreneur who had started as a newspaper boy, climbed the social ladder and a fortune built up his shop. Selfridge is a go-getter and has a clear goal. Shopping is fun, is the message he wants to share. He creates a luxurious department store, a prime attraction. Selfridge offered the first real shopping experience to its visitors. In London in 1909, this is a new phenomenon, a shop where all kinds of visitors simply can wander through and can touch the merchandise themselves. After opening the store, initially the customers kept away. It challenged Selfridge to think creatively to attract people to his new department store in London. For example, he invited the first man to cross the English Channel in an airplane in his shop. Authors sign their books, lectures are given and even a seance takes place in the warehouse. He regularly organizes such events which he gets publicity. He is a true pioneer and a perfectionist. Everything has to be right for the customer. The windows of Selfridges became almost as famous as the store itself. They are repeatedly artworks in themselves and are an attraction for tourists, designers and fashion lovers to follow the latest trends. The series offers a portrait of an enterprising entrepreneur with a clear vision on entrepreneurship, marketing, and customer experience that is timeless. The addressing of Selfridge was followed. The windows of the Bijenkorf in Amsterdam, Harrods in London or Bloomingdales in NYC are still often pleasing to the eye and reason to walk along here at Christmas time. 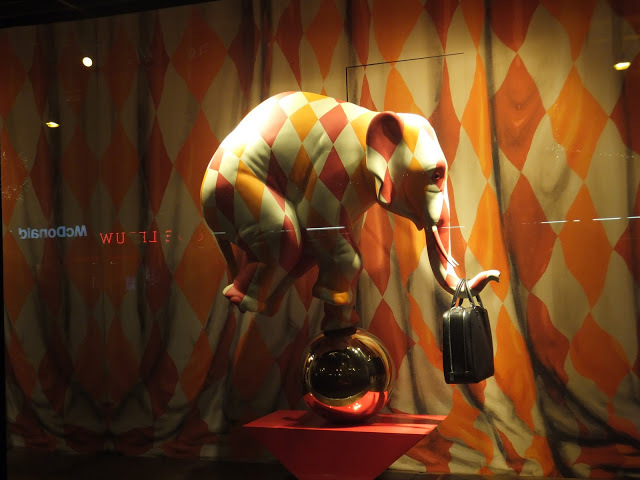 The window opposite is specially designed for Louis Vuitton. Since 2010, the Bijenkorf is part of the Selfridges group. The Dutch newspaper NRC of 28 September had an interview with shopping street manager Nel de Jager. She is amazed by retailers who don’t change their shopping window for months. Just an innovative showcase is a trigger for a passerby to look inside. That knew Mr. Selfridge in 1909 already. Entice your customers to unexpected purchases. Encourage your employees to dedication and passion for your store. Arouse the senses of your customers. Extend the residence time of your customer in your store. Create an attractive, surprising and varied shopping window.